Having problems with your door? 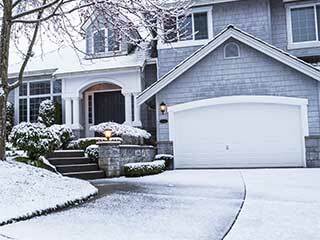 “A stitch in time saves nine” - a timely effort made on your part to winterize the garage will prevent having more work done (and money spent) at a later date. First of all, take some time to inspect the door both when it’s open and closed and look for anything out of the ordinary. You should also listen to any sounds the door might make while going up or down. If it operates without glitches with the door opener, try opening it manually. Write down any suspicious behavior or sounds, so you can report them to our team. Make sure you test the keypad and garage door opener for any inconsistencies or delayed response. Put in a new set of batteries and always keep a fresh set close at hand. If you look at the door while it’s closed and can see the light coming through the cracks, know that those same cracks will let the cold air into your garage as well. Your garage will be warmer if you close those gaps by sealing, insulating or repairing the door. Adding insulation to your garage door will not only increase the temperature inside the garage, but will also prevent moisture build-up on the door. This moisture can turn into ice and make the door so heavy it fails to open. Check for brittle or cracked spots and see whether there are any weather stripping pieces missing. Weather stripping should protect the garage from things like wind, rain and snow so it’s better you have it changed before the cold weather sets in. Lubrication of moving parts is of utmost importance throughout the year, but even more so before winter months. Metal parts can contract and jam in cold weather, but you can stop that from happening by applying a lubricant. The garage opener sensor is the thing preventing your garage door closing on someone or something standing its path. If the sensor is covered with frost or condensation, it cannot function correctly. The solution is simple - just wipe off the sensors, and you’re done! Encountering problems with your garage door is no doubt a hassle that needs to be taken care of immediately. Rather than frantically try to solve the problem by yourself, our professional technicians can come to your rescue! Our company offers a wide range of repair services, giving you the convenience that you deserve! Thank you for choosing our company! Feel free to browse our website for more information in the meantime. Our team at Garage Door Repair Newcastle is at your service any time!